Here are a few steps that let me trade quickly, first to confirm that the card country is the United States! 3. Please note that we only accept pictures of physical CARDS, not modified pictures and codes. 4. If you do not have a clear picture, you must provide the correct code. I have no time to try the code. My apple account was blocked because of your bank card. Or limited to purchases. I'm not going to issue bitcoin. 6. If there is any problem with your card, such as exchange, deactivation or use, I will not release bitcoin. 7. If your card is $101-500, I will not issue bitcoin. 8. The card country is inconsistent with the transaction. 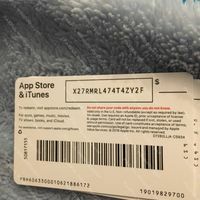 Bitcoins de Paxful Comprar bitcoins con iTunes Gift Card Compre bitcoins con iTunes Gift Card por USD Producto #: :is_hashed 5 comentarios positivos, basados en 1 reseñas 5 comentarios positivos, basados en :feedback_total reseñas $10697.60 USD Ahora Disponible en: hyepp En línea. ¡Comprar ahora!